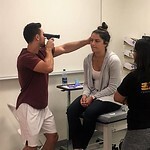 Graduate clinicians in the School of Health and Medical Sciences' Speech-Language Pathology (SLP) and Physician Assistant (PA) programs participated in an Interprofessional Education (IPE) experience on Friday, September 7th. 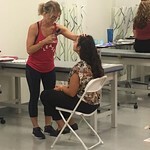 The IPE experience co-organized by SLP and PA faculty allowed first-year students from each program to collaborate while performing physical examinations specific to their respective training. Co-leads of the interprofessional experience are Nina Capone Singleton, PhD, CCC-SLP and Michelle McWeeney, MS, PA-C. 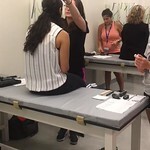 In addition, faculty members Tatiana Dell'Aquila, MS, PA-C, Christine Fernandez, MD and Abby Saunders, MS, PA-C, supervised the students along with adjunct faculty who are alumni of the Department of SLP: Matthew Masiello, MS, CCC-SLP, Christina Barnes, MS, CCC-SLP, and Stefani LaManna, MS, CCC-SLP. 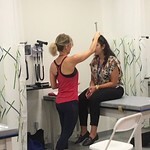 Each cohort alternated serving as patient then clinician, moving through specific benchmarks of examination relative to their fields of study. 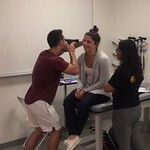 Physician Assistant students applied their knowledge of the Head-Eyes-Ears-Nose-Throat (HEENT) exam while Speech-Language Pathology students conducted an examination of oral mechanisms, providing a shared learning experience. "Our interprofessional goal is for our professions to learn about each other, and from each other, through this educational collaboration," states co-lead Dr. Nina Capone Singleton. 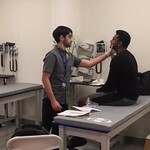 This initiative is just one of many best practices implemented at SHMS to develop in future healthcare providers the team building skills and partnership necessary to provide patient centered care. 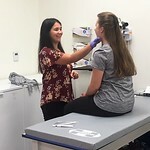 By bringing students from different disciplines together, it also encourages an understanding across disciplines, which is vital to providing improved healthcare outcomes for patients. 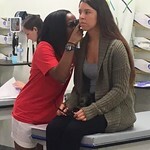 The IPE experience additionally aims to build empathy for the patient populations served. 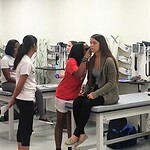 The students were excited to work with and learn from one another, and the faculty continues to create additional interprofessional education opportunities. 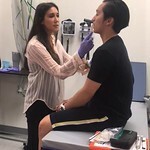 The School of Health and Medical Sciences values interprofessional practice and education as evidenced through the Center for Interprofessional Education and Health Sciences (CIEHS).